Earth and Boris are the perfect happy meal combination made in the heavens of shoegaze-drone—post-metal lovers. 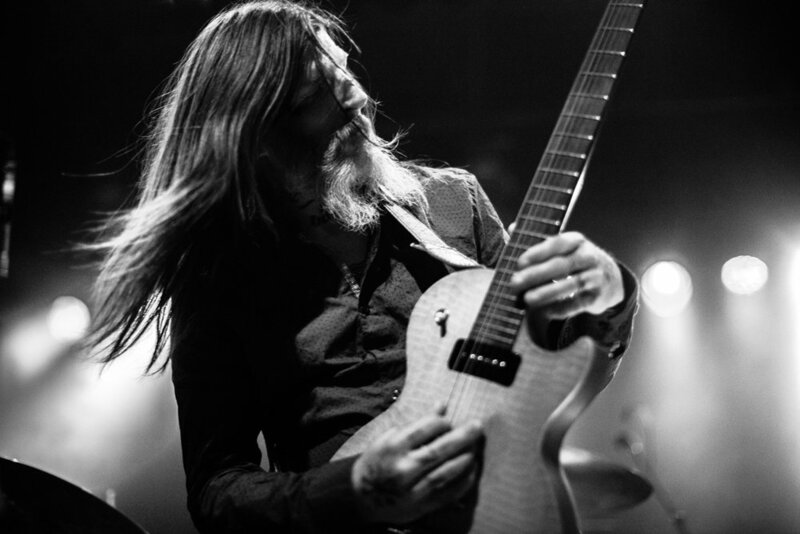 The show started with a restrained and intimate set by EARTH, the band led by Dylan Carlson, a man famous for his dense, slow, and minimalistic approach to guitar. Without much interaction with the audience, the band created a dark and somber mood that slowly evolved into a deeper and intense amalgame of downtempo drumming with heavy riffs. Earth’s music gets into your bones and crushes your guts. The weight of the sound makes the time stand still. The set included just a few long and contemplative songs, taking the audience into a journey through albums like “The Bees Made Honey in the Lion’s Skull”, “Angels of Darkness, Demons of Light”, and their latest release “Primitive and Deadly”. The band has been taking heavy music to uncharted territories for many years, as they keep their focus in slow evolving dense harmonies. The show was an astonishing instrumental set, the perfect opening to the intensity of the next band. Nothing gets you ready for BORIS, a Japanese trio who lives by the rule of: CHANGE IS EVERYTHING. On this tour they are performing their great album, PINK, released back in 2005 to great praise from critics and fans alike. This is an interesting record in Boris’ canon, an album that takes the melancholy-shoegaze of My Bloody Valentine, the density of Godspeed You Black Emperor, the attitude of Black Flag, the dissonance of early Sonic Youth, and at certain moments, the speed and thrashing elements of Slayer. If you want a trip to the unexpected you should listen to the album PINK, if you want to see a show with an intense moshpit and sudden elements of emotion, BORIS is definitively the right place to be. The concert started with a quiet WAKA setting up her guitar, keyboards, and multiple gadgets. An energetic TAKESHI ready for the attack, holding his classic double neck guitar and bass, that has become a trademark of the band. After a few seconds of silence, this moment, was the perfect introduction to ATSUO, the flamboyant drummer and singer greeting the audience at the center of the stage. This is an intense show filled with emotion and aggression, a sea of sweaty bodies enjoying every single attack from the band. Boris has released 23 albums in their twenty-something year long career, they constantly collaborate with many artists, such as drone-ambient masters Sun-O))), and with experimental pioneer Merzbow among many others. To this day, I feel PINK is an album that contains many elements explored by the band’s trajectory in one piece. It might be more raw at moments but encompasses the band’s concept right from the get go. Earth and Boris are bands that avoid belonging to any specific genre, they both gravitate towards experimentation. Many want them to be the craftsmen who created post-metal alongside Neurosis, Melvins and Justin Broadrick with his many projects. To me the only common thread that all these artists have, is a deep understanding of distortion, psychedelia, and heavy riffs. Whatever name or label you want to give them, their uncompromising approach to music is what makes them great; and like the happy meal, the reason why they both influenced a new generation of musicians.